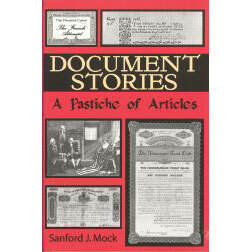 DOCUMENT STORIES: A Pastiche of Articles by Sanford Judson Mock. Sandy Mock is no stranger to the readers of Manuscripts. His lively and interesting articles have graced the journal’s pages on many occasions. Mock fans now have a chance to read not only the articles which have appeared in Manuscripts, but those he has written for the publications of the Museum of American Financial History and the International Bond & Share Society. 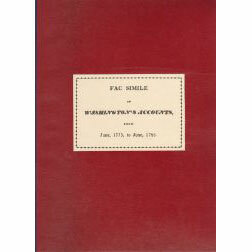 Mock donated 300 copies of his book for the benefit of the Manuscript Society. Document Stories can be ordered from Oak Knoll Press. FACSIMILE of WASHINGTON’S ACCOUNTS, from June, 1775, to June, 1783. George Washington’s expenses during the American Revolution provide fascinating reading in this limited edition of 1783 copies. Reproduced from an edition first printed in 1833 with an introduction by former Society President John M. Taylor, the facsimile provides a superb reproduction of Washington’s own handwriting. Former Society President William R. Coleman arranged for the facsimile’s publication and donated it to the Society for its benefit. Washington’s Accounts can be ordered from Oak Knoll Press. More than a half-century has passed since the founding of The Manuscript Society in Chicago in 1948. To help commemorate this important milestone, the Society has commissioned former Society President John M. Taylor, the author of six acclaimed books in the fields of history and biography, to write a definitive history of the Society. The volume was published as part of the Society’s 50th anniversary celebration. 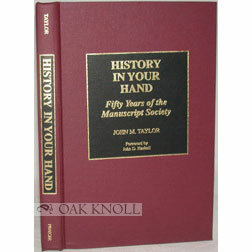 History in Your Hand can be ordered from Oak Knoll Press. 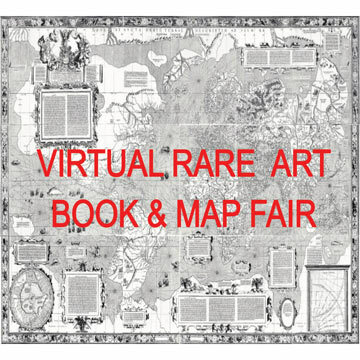 In this book covering the most popular collecting topics, some of America’s pre-eminent collectors and scholars consider the men and women whose autographs are most eagerly sought by collectors. Lists of names in each collecting category are embellished with dates, terms of office, or other useful facts. Much of the information provided is not readily available elsewhere. Most helpful is the ranking of each person’s autograph by scarcity.